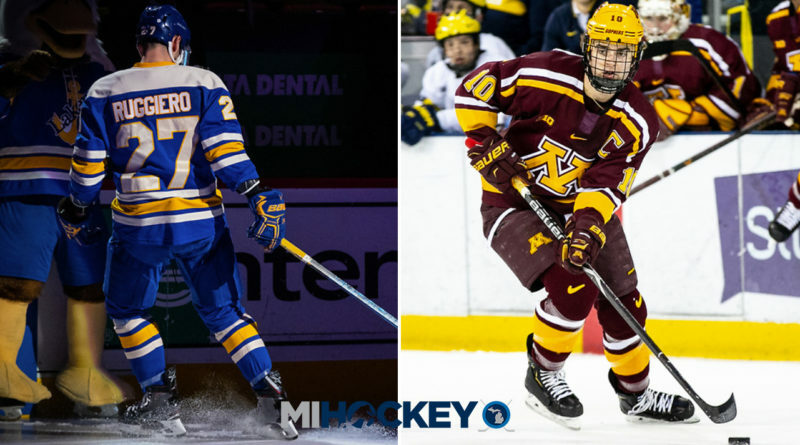 A couple more Michigan names are moving up from the collegiate ranks. The San Diego Gulls, AHL affiliate to the Anaheim Ducks, have signed forward Brent Gates Jr. and defenseman Steven Ruggiero to amateur tryout agreements. Gates Jr., a 21-year-old Grand Rapids native, wrapped up his senior campaign with Minnesota, where he set career-high marks in assists and points while serving as team captain. Gates Jr. finished his final year with 13 goals and 18 assists for 31 points in 38 games. Gates Jr. was a Ducks third-round pick in 2015. He finished his four-year career with 42 goals and 85 points. Ruggiero, meanwhile, posted a career-high 11 points in 37 games with Lake Superior State this past season, his senior year. Ruggiero made massive strides in his final season after transferring from Providence College following his sophomore year. The 6-foot-3, 220-pound Ruggiero was originally a sixth-round pick of the Ducks in 2015.